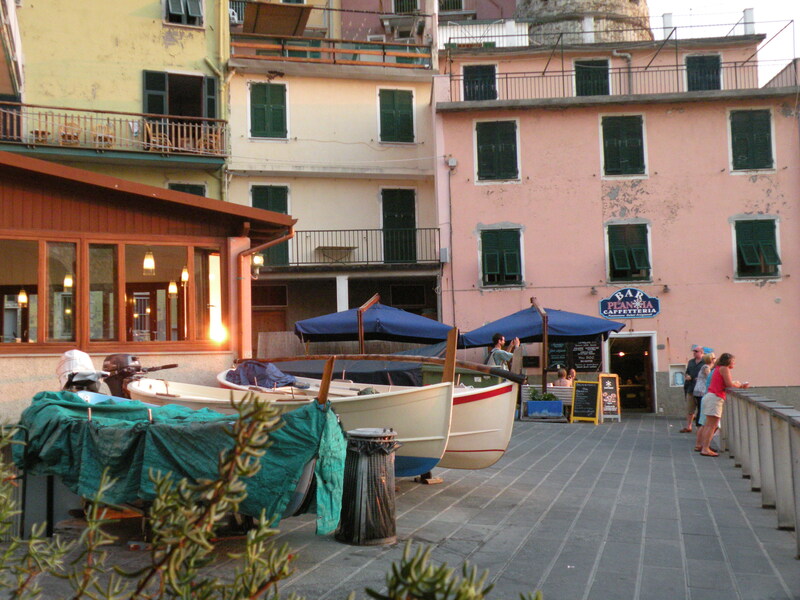 I’m sitting on the deck of the Marina Piccola Ristorante in the village of Manarola in the Cinque Terre (ching-quay tay-reh) which is in the Liguira region of Italy, sometimes referred to as the Italian Riviera. 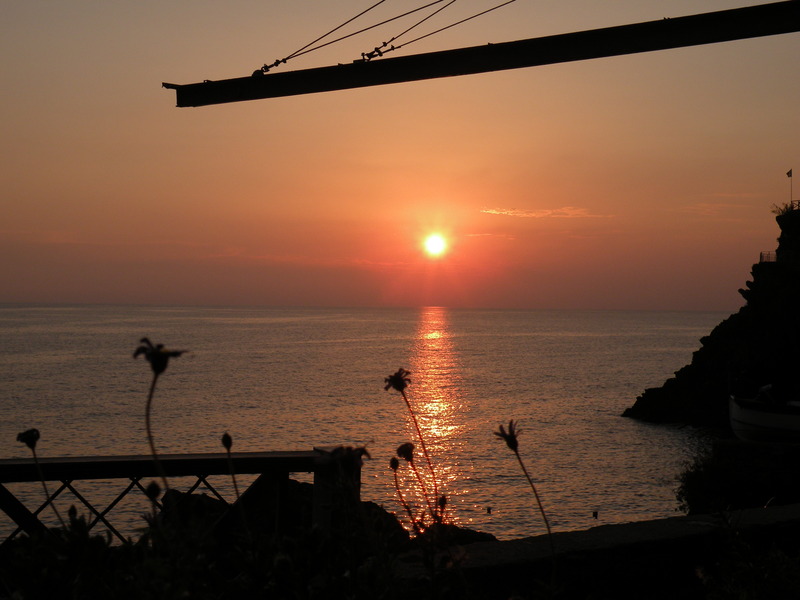 The sun is setting just over my right shoulder, small fishing boats are being lowered into the water and the smell of the Mediterranean and seafood cooking fills the air. I’m listening to the sounds of seagulls, the water caressing the rocks below and kids playing in the water. 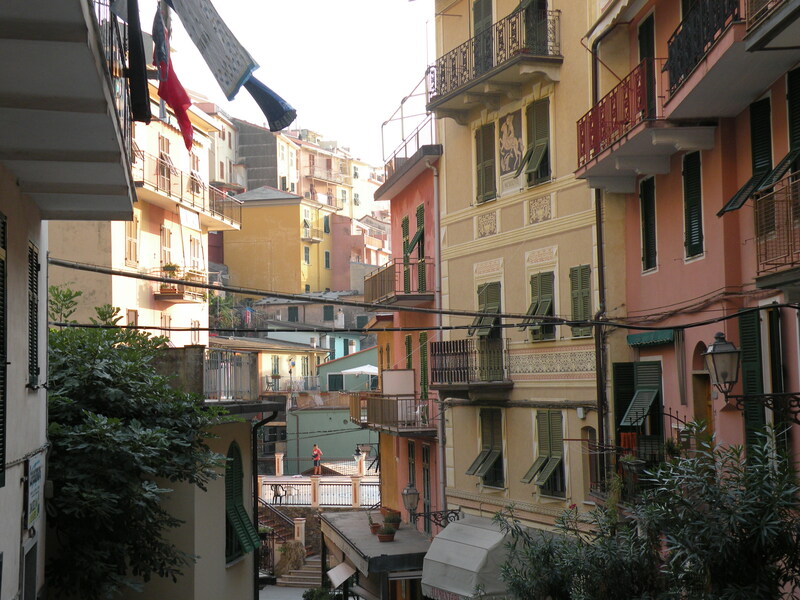 The yellow, orange, red, pink, and green colored buildings with their faded and peeling walls and laundry drying on the clotheslines strung up on the balconies, fill my field of vision. Just forward and to the right of me are three small fishing boats with outboards that will be launched later tonight when their owners fish for anchovies. The low angle light from the setting sun makes for a truly spectacular display. 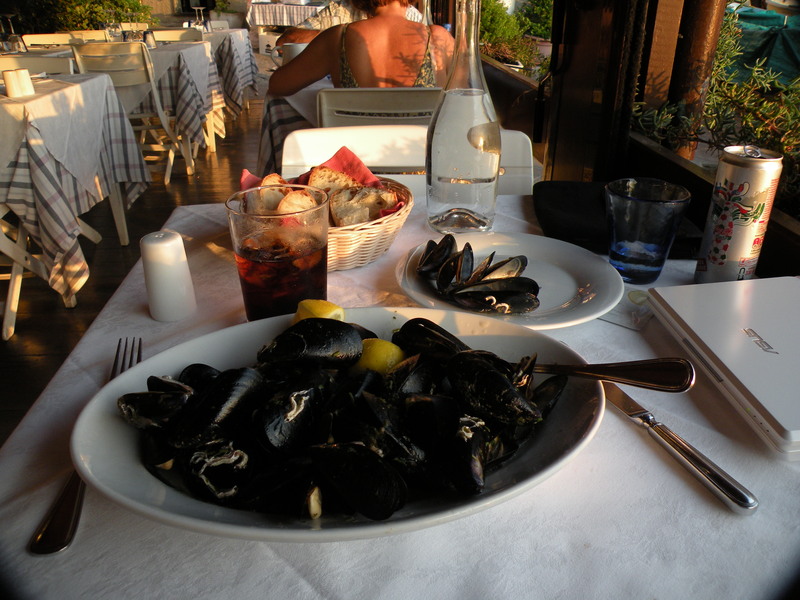 I just had the antipasti (appetizer) of mussels and they were about as fresh as they can be. My server, Leonardo, just brought the primi piatti (first course); spaghetti al pesto and it’s by far the best pesto I’ve ever had. It ought to be; pesto was invented here in this region. I left that oven they call Rome this morning, a little disappointed in myself for not sticking it out to see the coliseum, the forum and perhaps some other Roman ruins. 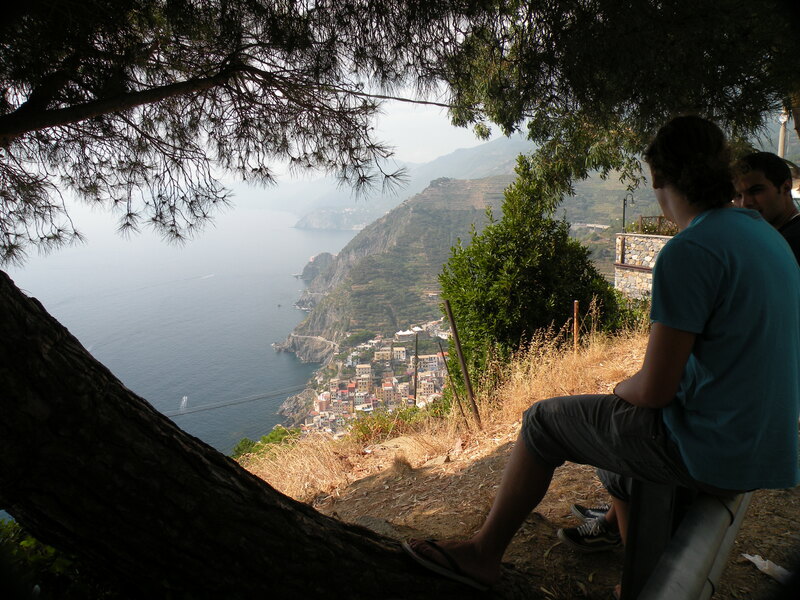 I also gave up the visit to the Amalfi coast further south, where I was going to stay in Sorrento and visit Naples and Pompeii. I’ll get over it though. I’ll just make another trip sometime, in the Fall or Winter to see southern Italy and perhaps Greece. That of course after my trip to Scandinavia and the other trip to Spain and Portugal, oh yes and the trip to see all of the UK and Ireland. 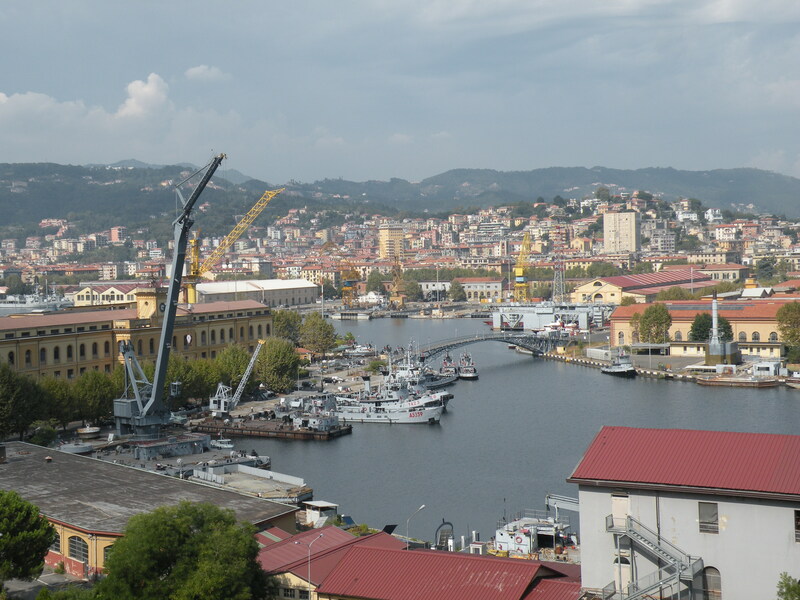 The leisurely trip north along the Mediterranean was pleasant and relaxing in my air conditioned car and only took about five hours to get to La Spezia, the main city just south of the Cinque Terre. The CT, literally the five lands, was not ever well known until certain travel guides discovered it and put it their books and videos. Prior to that, it was visited primarily by some in-the-know Italians and mostly Germans. The CT consists of five, centuries old villages built into the cliffs and ravines on the northwest Italian coast, spread out over 12 kilometers. Fishing, along with the grape vineyards and olive groves were the primary industries here. 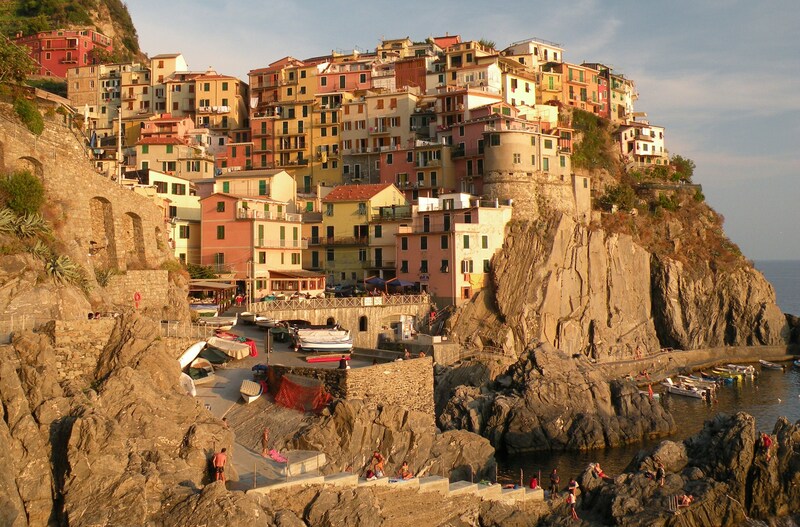 Riomaggiore, Manarola, Corniglia, Vernazza, and Monterosso al Mare make up the CT. 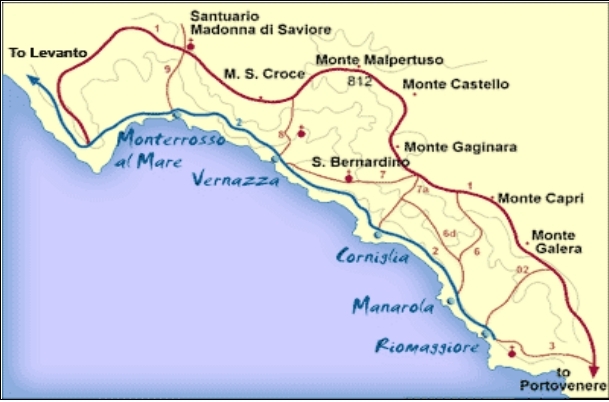 The villages are linked by trails; terraced vineyards and olive groves line the slopes above the villages. Several years ago when the place started becoming a tourist destination, the locals banded together and had the area declared a national park to keep the developers out. It worked. No cars on the roads, no hotel or food chains, everything just as it has always been. The fishing industry sort of died off for a while and times were tough but the tourist industry helped the CT prosper thanks to the same certain tourist guides. 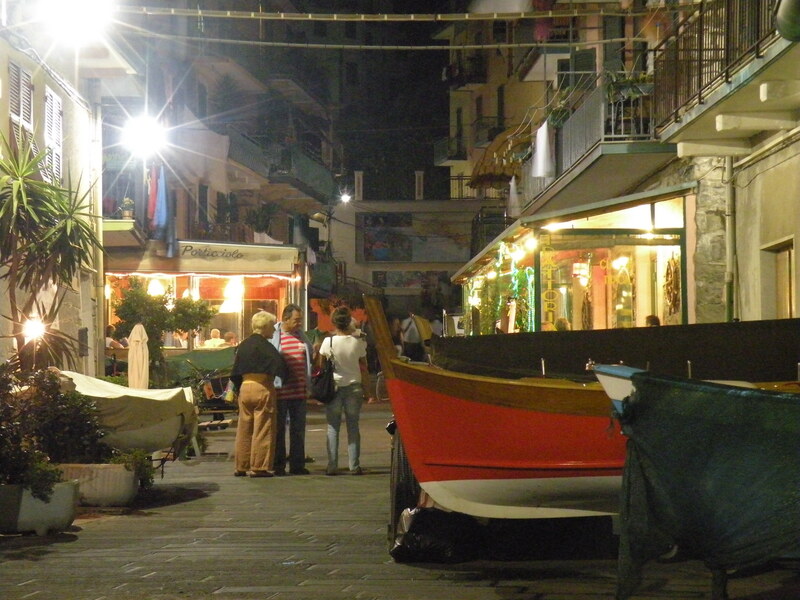 Many locals turned their homes into B&Bs and pensions and they opened restaurants and shops and the fishing was revived a bit to support all the new local restaurants. I’m guessing the locals are enjoying a slightly easier life, at least I hope they are, and why shouldn’t they? I’m now working on the piatti due (second course) of beef escalopes. It’s not the most tender meat I’ve ever had, not sure if it’s supposed to be, but in any case, the taste makes up for it. I don’t think I’ve ever had anything like it; I don’t know how to describe it but I really like it. 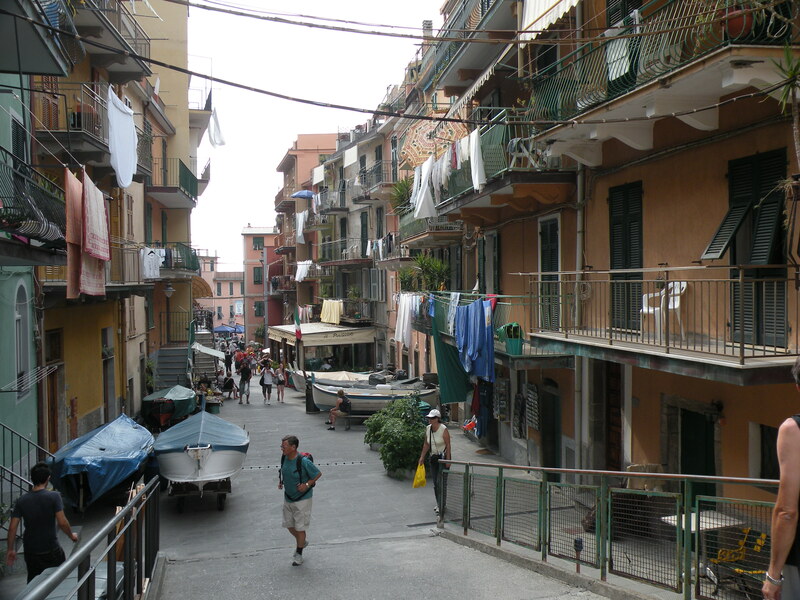 From La Spezia, I drove into the park and started making my way to the villages. There is a road up high on the cliffs that link the villages as well, but you can only get so close to the actual towns. 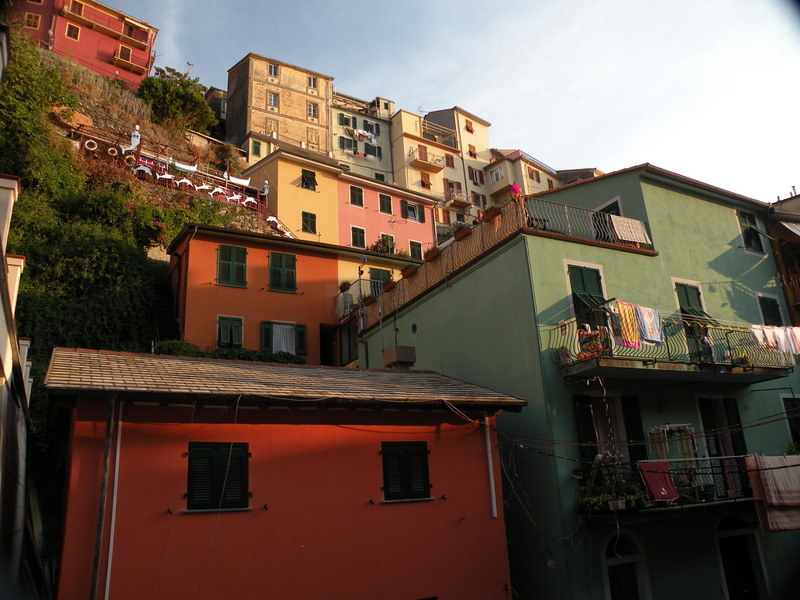 I first passed Riomaggiore and I tried but I couldn’t get an angle from the road to really see the town. That’s OK, I plan to visit each village on foot. I was getting anxious and had butterflies in my belly; I was really looking forward to this. 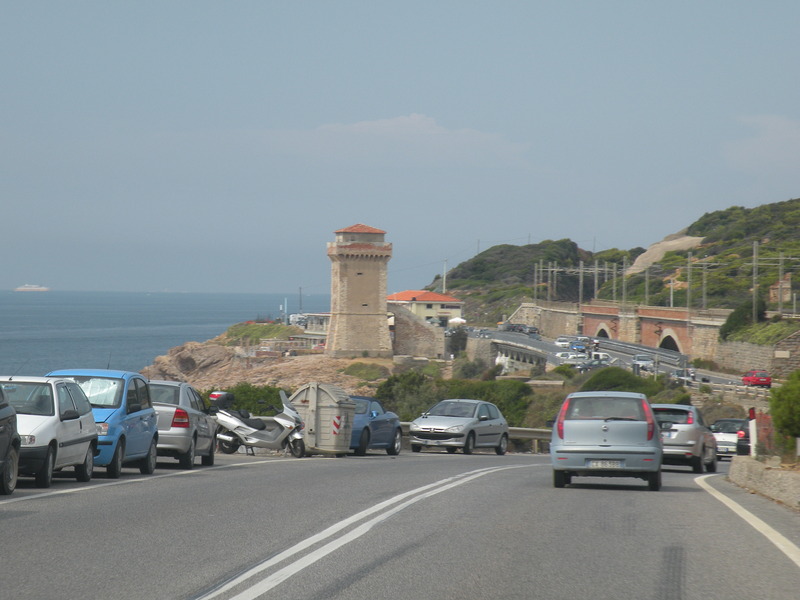 I took the next exit for Manarola and drove as far as I could. I parked the car and loaded up my packs. It was pretty warm today, but not as bad as Rome. I hiked down and down and more down. As I started coming into town it started looking somewhat familiar as I had seen so many photographs of the place. I even had a picture of the CT on my PC wallpaper at work. Ah work… a fading memory. 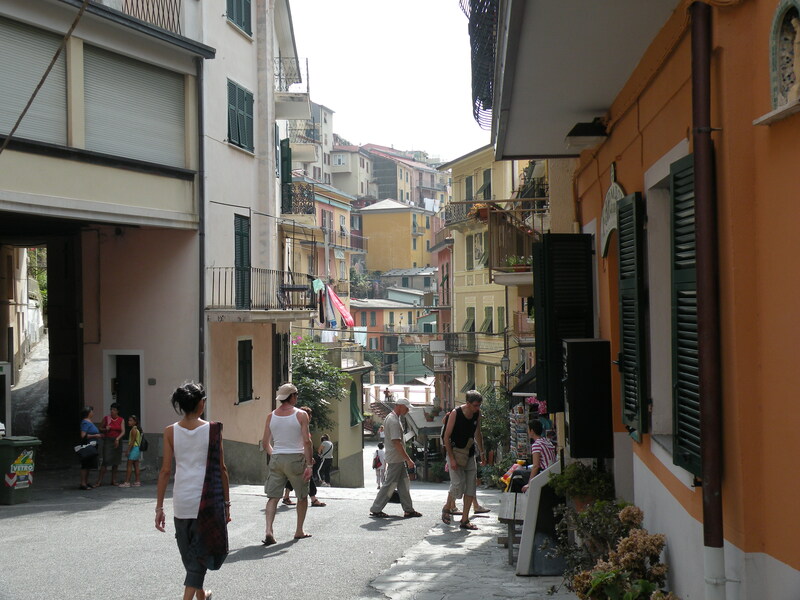 At the beginning of the town, still high up on the cliffs, I saw the sign for the Ostello (hostel), The Hostel Cinque Terre to be precise, but I kept walking for I am staying in a private air-conditioned hotel room. I kept hiking down into the town, through the town, marveling at what I was seeing, and I hiked all the way to the end of town, where it meets the water. The Hotel Marina Piccola would be my home for the next few days. I checked in and the room is just fine. The AC went on first. I don’t have a sea view but my window with shutters opens up onto the street I just hiked down; so colorful it is, and with character. I mentioned in a previous post from Hallstatt, Austria that there are two primary places or highlights of this trip that I was really looking forward to. Places that spoke to me. The CT is the second of those places; 2 of 2. I had seen the CT on Rick‘s videos, read up on it and seen lots of pictures. And now I’m here, and it didn’t let me down. It’s been almost three hours since I sat down here at my table and started writing. It’s dark and there’s a slight breeze coming from the Mediterranean. Apparently, there’s a third and fourth course to this meal, but I just had to say Uncle. Leonardo sort of understood, but doesn’t fully get the finer points of Uncle. I now have a chocolate tort with pears sitting in front of me that simply must be consumed post haste. So I’m going to consume this demanding little tort and then go sit by the sea and listen to the water for a bit before retiring to my room. Neener neener. Have someone take your picture. Haven’t seen you in awhile. Maggie. 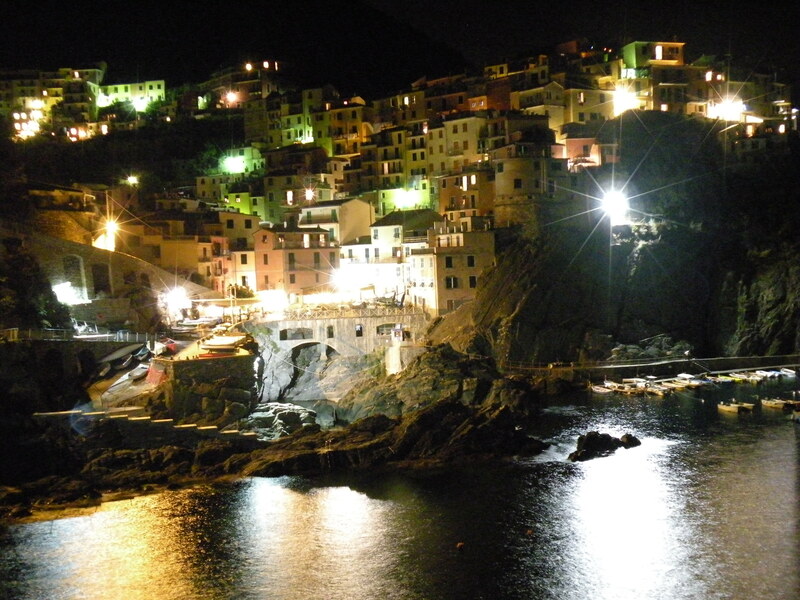 You made it to Cinque Terre. I haven’t logged into your travels in a few days so was scrolling through and saw the picture of Manarola at right and stopped here. Sounds like you didn’t see all of Rome because of the heat. I’ll read up on that in the next few days. I’ve got to go now. Got a tennis date with a friend. Take care.